The New Press Education Reader brings together the work of progressive writers and educators--among them Lisa Delpit, Herbert Kohl, William Ayers, and Maxine Greene--whose voices have been instrumental in shaping the field of education today. These outstanding contributors discuss the most pressing and challenging issues now facing us, including schools and social justice, equity issues, tracking and testing, combating racism and homophobia, closing the achievement gap, children in poverty, faculty retention and recruitment, multicultural and bilingual education, rethinking history, and the effects of consumerism on children. Written in clear and thought-provoking prose, these essential pieces offer new perspectives on the classroom and the curriculum. The New Press Education Reader has been compiled by Ellen Gordon Reeves, who, in addition to being the education editor at The New Press for over a decade, is a veteran classroom teacher with experience in elementary, middle, high school, and graduate school classrooms in both public and private schools in Europe and America. Featuring more than two dozen accessible and inspiring pieces that have become--or are destined to become--classics in the field, The New Press Education Reader is an indispensable resource for parents, policy makers, and practitioners alike. Ellen Gordon Reeves is president of the Harvard Alumni Association. She is an author and was previously the education editor at The New Press. 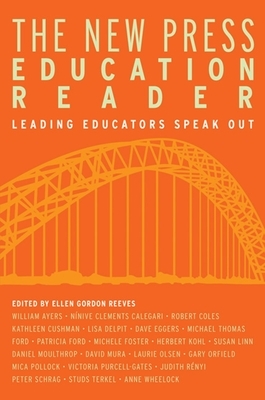 While at The New Press she edited The New Press Education Reader: Leading Educators Speak Out. Reeves is the author of Can I Wear My Nose Ring to the Interview?. She currently divides her time between Boston, Providence, and New York City, where she serves as the resume and job-hunting expert at the Columbia Publishing Course.